This village, just 8 kilometers from town and on the hillside overlooking Ai. 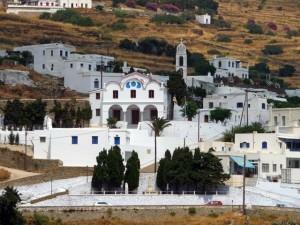 Fokas, is one of the most desirable villages on the island for holiday-home buyers. The houses, all clustered together to form a village, are indeed pretty to look at when approaching from the road. But, the real beauty is from within the village looking out. The view is one of the best anywhere in Greece. You have the magnificent hillside sweeping down the valley to the sea, then the incredibly expansive view of the sea, with several small islands in the distance. In the lush green valley, you have a smattering of small white houses and dovecotes mixed among the terraced hills. The tiny community of Berdemniaros, with its outstanding architecture, sits on the main road just before the start of Triandaros. As you approach the larger village from town, you’ll notice the village of Dyo Choria above and to the right, and the village of Arnados above and to the left.